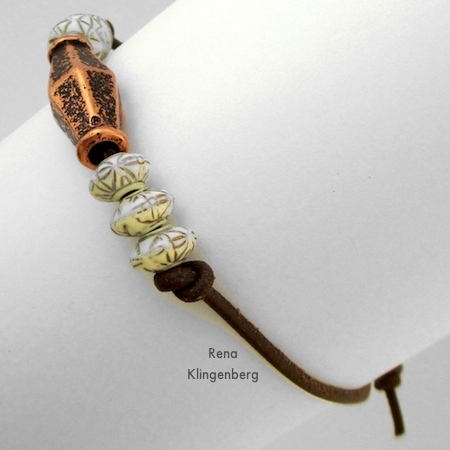 With this bracelet’s adjustable closure, you can easily create bracelets that will fit wrists securely and comfortably. 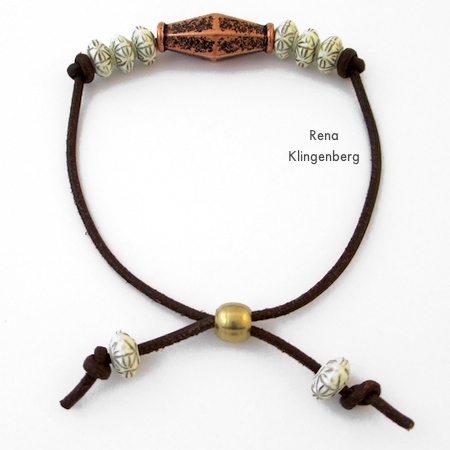 This is a great bracelet style for guys and gals of all ages. Stack up several of them on your wrist! 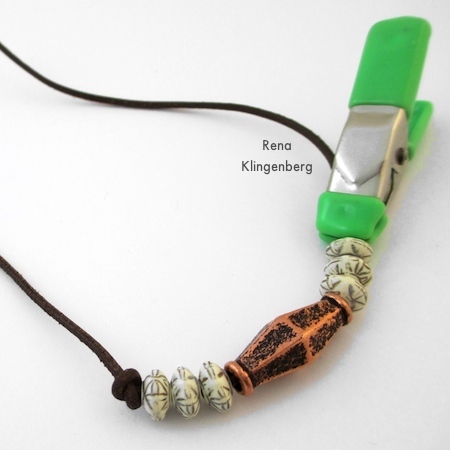 This is also a fun project to teach to kids, teens, and beginning jewelry artists of any age! Slide the cord ends through the tube bead to make the bracelet large enough to slip on over your hand and onto your wrist (shown in the photo at left below). Cord – leather, satin, cotton, or other. I used 2mm thick leather cord. How Much Cord Do You Need? Measure the wrist that will be wearing the bracelet. Then add 8″ (203mm) to the wrist measurement. Example: Wrist measurement of 7″. 7″ wrist + 8″ = 15″ piece of cord. 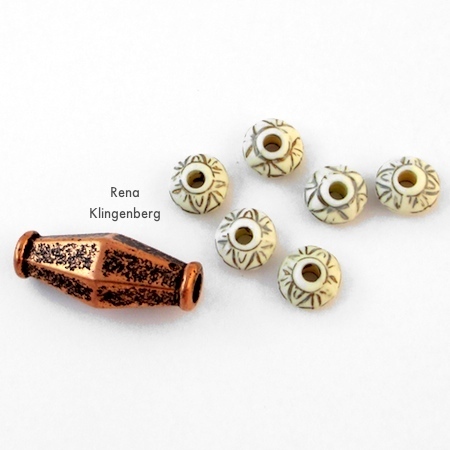 Decorative beads with a hole size that will fit onto your bracelet cord. I used 1 focal bead and 6 smaller beads, each with a 2mm hole size to fit onto my cord. 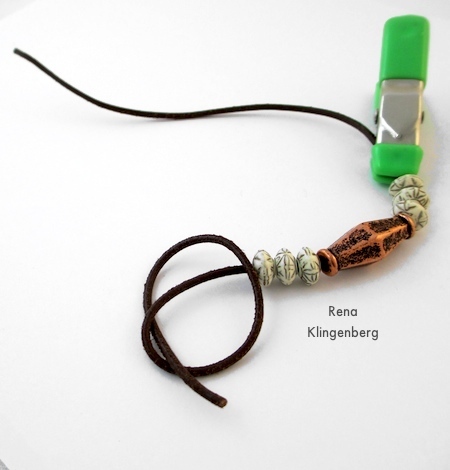 2 “end-beads” that will be next to the knotted cord ends. 1 bead with a hole that’s 2x the width of your cord. 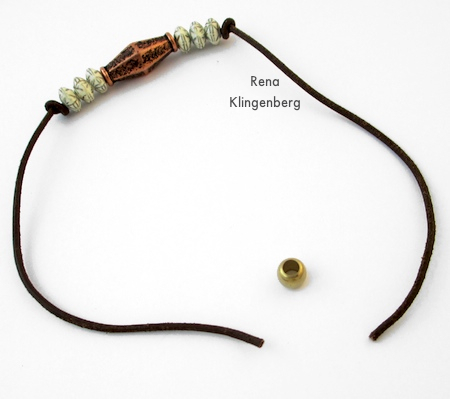 This is the “tube bead” that your cord ends will slide through to make the bracelet adjustable. So for my 2mm cord, I used a brass bead with a 4mm hole. 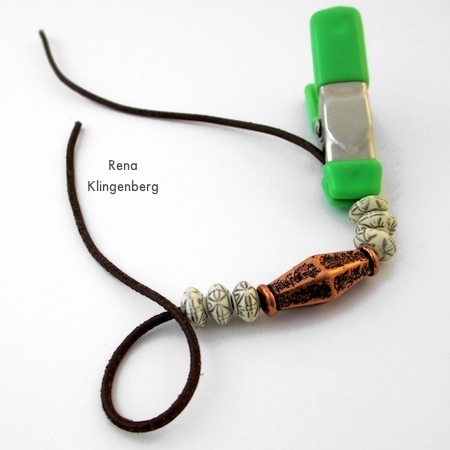 A small clip, clothespin, or binder clip – to prevent your beads from sliding off the cord. We’ll start out by choosing the beads for this project. 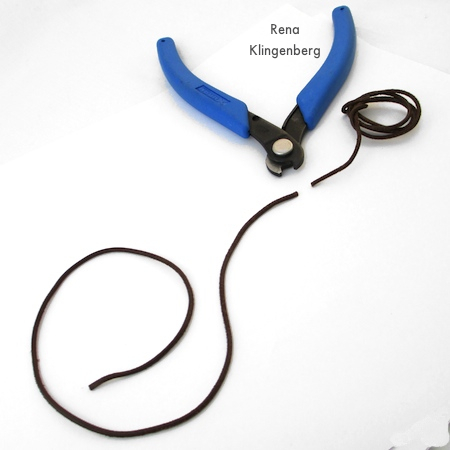 Now it’s time to cut the length of cord you need for your bracelet. After measuring my wrist at 6.5″ (165mm), I added 8″ (203mm) extra for the knots and bracelet ends.
. . . and slide them around to the center of the cord. Next, to keep the beads centered in place on the cord, we’ll make a simple knot in the cord, at each end of the beads. We’ll make the first knot at the cord end that isn’t clamped. Now we’ll make a small knot at the end of the cord. Then tighten the knot, sliding it toward the end of the cord. Thanks for mentioning that, Barbara! I haven’t had that situation yet with my bracelets, but – depending on the type of cord – it’s certainly something to keep in mind. Cheryl, that’s so lovely to hear! And I love the idea of your bracelet flanking your wrist with love. So glad this project got you back to your worktable! 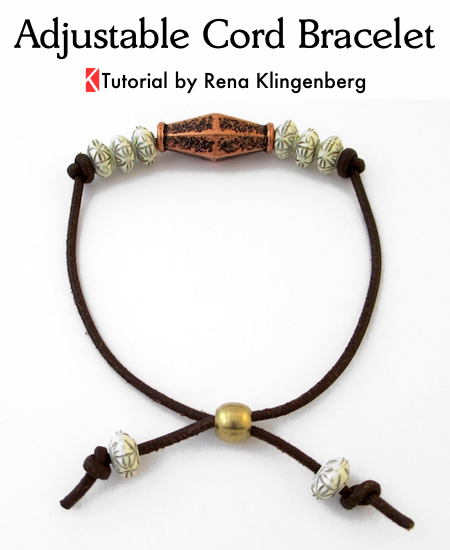 Love this tutorial and can’t wait to make a bracelet. Thanks for always inspiring me to try new things. 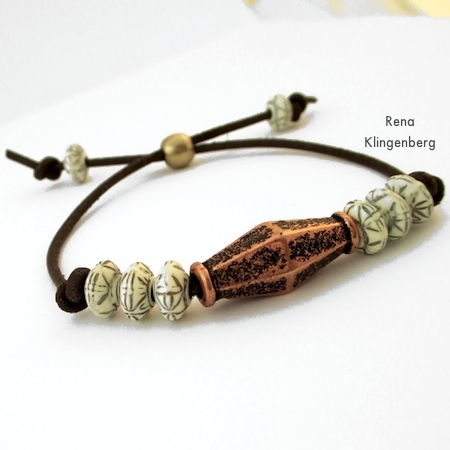 Loved this tutorial…thank you, Rena! would sell for? I do craft fairs and I made some really nice knotted bracelets and was charging $25. I belonged to a jewelry group and I asked for critique. They told me I should be selling them for $10. The beads were pretty expensive and it made me discouraged. Pricing is so hard. I had a retail store for 19 years and had no trouble there but people think you should give stuff away at craft fairs. Hi Shari, I use my jewelry pricing formula for pricing my jewelry, to make sure I’m not losing money on the sale of my items. If you follow the formula and people say your prices are too high, then you may be showing your jewelry to the wrong crowd or in the wrong venue. You may need to target a different audience – or sell your jewelry in different places. And / or you may need to package, display, and promote the piece as being worth the price. Hi. I’ve been looking everywhere trying to explain my brscelet, and I followed you here. My bracelet can now call itself an “adjustable cord bracelet” that was made in silver. I liked it because it had a partial bar of silver as a decorative touch, running between two silver chains that attached to the each end of the bar and then met at the back of the bracelet where they entered a silver round bead that served to tighten the bracelet to your liking. However, as I was trying to get it on, one of the chains broke off of the bar rendering it useless. I have bad eyes, and I could not tell whee the break happened, but it seems it just pulled itself sway from one chain link, and if my eyes were what they used to be, I would have had it rejoined very quickly. As it is, I can’t even imagine what it looks like on. It’s not a piece of fine jewery; I just like it. I used to do all my own jewelry repairs myself until my eyesight got too bad, but wht would you advice, given it’s costume jewelry? Do you have any hacks you can share with me? Stacy, could you use a jump ring to repair the break, or possibly use a piece of wire to create a decorative way to fix the break? If it’s too small for you to see, could you direct a friend on how to do the fix with a jump ring? 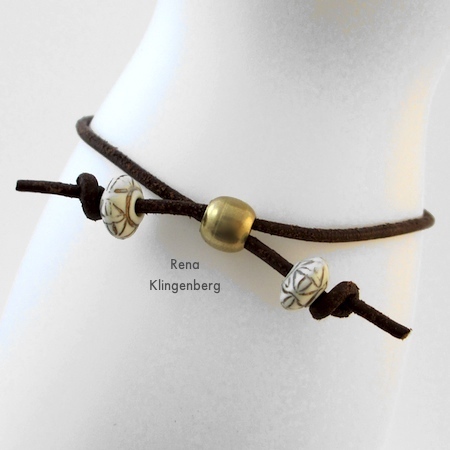 Hi Rena, of course I love this bracelet….it is from you. Love all of your designs. 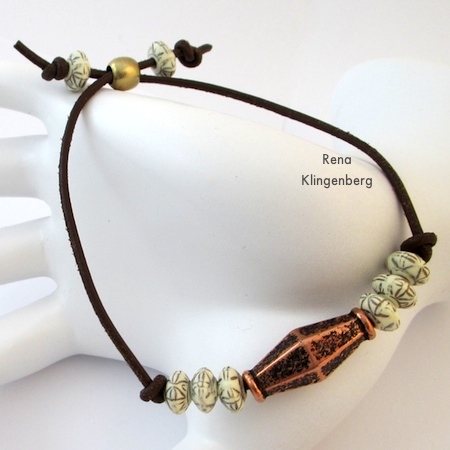 I adjusted your design by using a copper tube in the middle and small silver beads (with a raised design on the beads) on each side. Finished look is unique. Thanks for the inspiration. Excellent article! thank you! I will try this today! How do you get the bracelet to stay tight when you are wearing it? Knot it on or should it stay on its own? I may have just done it wrong. I am just starting out and love your tutorial! But I am having a very hard time finding interesting artsy beads with larger holes online. Do you have one or two favorite places that you purchase yours? Thank you. Hi Gail! Thanks for asking. I like shopping for jewelry supplies on etsy.com . Once you decide what size of bead hole, you can do a search on etsy. For example, if you need beads with 4mm hole, just use the search box at the top of the Etsy page and type in a search like “large hole beads 4mm hole”. 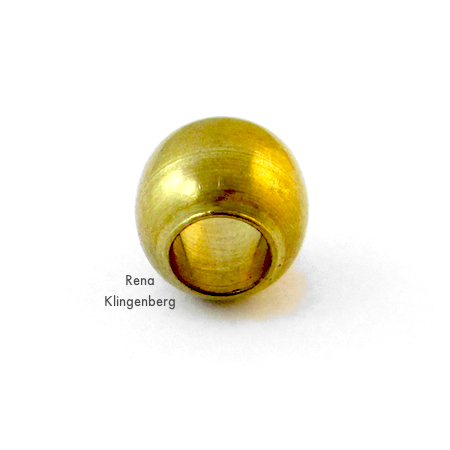 You can also use that same search, “large hole beads 4mm hole” to search Google for other suppliers of beads with the size of hole you’re seeking. Hope this helps! Im new to your site today. and also new to jewelry making. 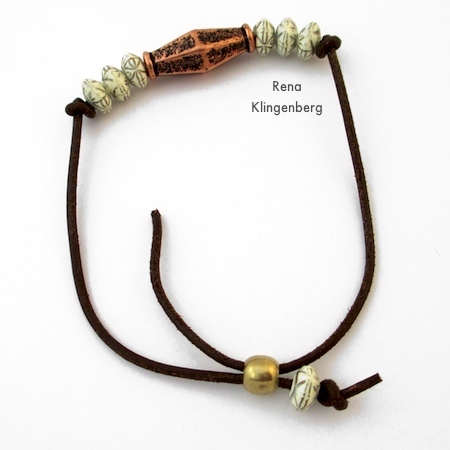 I like this bracelet a lot and I am wondering if you could use the same idea with a longer cord and make it into a necklace. I like matching sets! Thank you for such a clear tutorial. Can’t wait to try it . Best wishes. Can I use 2mm waxed cord and get nice results. Doing a volunteer project and think having some of these made would be great. Looking for a more economical solution though. Your thoughts?